Michael Hayden, former Director of the CIA and NSA, speaks at Nobel Week Dialogue: the Future of Truth conference on Dec. 9, 2017, in Gothenburg, Sweden. 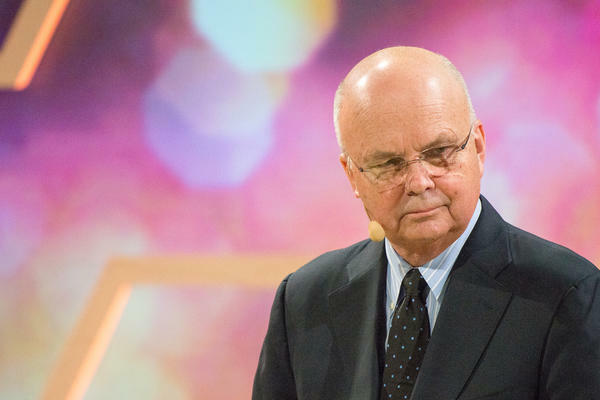 In The Assault On Intelligence, former CIA Director Michael Hayden says the Trump administration has ushered in what he calls a "post-truth world," and he scolds the president for waging a war on U.S. spy agencies. In its best form, Hayden writes, intelligence is the objective truth. "I've always viewed the role of intelligence as creating the left- and the right-hand boundaries of logical policy discussion," Hayden tells NPR. "If you deny intelligence its role, you deny yourself these boundaries — and that, of course, I think leads to some really serious situations." Let me begin with [Trump's] distrust of the community, which is a national tragedy. We always have a challenge establishing a relationship with a new president. President Trump was always going to see the world quite differently than the way we did, but then the relationship-building got stunted by the Russian interference. The first time we had to seriously talk with this president, we were trying to convince him of something that other Americans were using to discredit his legitimacy as president. So we began this in a ditch. We have a lot of presidents who've argued about intelligence — and if that was the only case here, this would be just one other story. But here's a case of a president who's shown evidence that he bases his decisions not on objective reality. A classic: He claimed that Barack Obama wiretapped Trump Tower. John Dickerson of CBS was pursuing him on this question, saying "Do you have evidence Mr. President? What's the evidence?" And the president's only response was, "a lot of people were saying — a lot of people agree with me." That is decision-making based upon something other than objective reality. What we have here is a president who does not seem to be controlled by the traditional norms of the office. We have never seen a president speak like this, act like this, disparage people like this. And of course, that generates a response from people who have been career professionals, because we think what the president's doing is very harmful. The challenge we have is — how do we push back against that without breaking our own norms? And so, for intelligence, it might be leaking. For journalism, it might be an overfixation on the work of the president. And so I have to be careful; people like me have to be careful [that] when we are pushing back — which we think is quite legitimate — we don't make the problem worse by undercutting our own legitimacy. What we have — and this is the core issue — we, plural, the big We, are in a post-truth world, a world in which decisions are far more based upon emotion and preference than they are on objective reality, data and details. And that's an overturning of the Western way of thought since the Enlightenment. President Trump identified it, President Trump exploited it, and I think President Trump worsens it by the some of the things he does in office. But the trend is well beyond him and well beyond America. Art Silverman and Jolie Myers produced and edited the audio story. Sydnee Monday adapted it for the Web. A possible summit with the leader of North Korea. A deadline to decide whether to restore sanctions on Iran. The move of the embassy from Tel Aviv to Jerusalem and Israel. President Trump has a heaping plate of foreign policy to consume in the month of May. At this point, most past presidents would be leaning on the intelligence community for guidance and context. But President Trump has made plain his differences with the CIA, FBI and NSA, and some members of the intelligence community say they feel sidelined by this White House. In his new book, former CIA Director Michael Hayden rips into President Trump for waging a war on U.S. spy agencies. And he calls out the Trump administration for ushering in what he calls a post-truth world. General Hayden spoke with our colleague Ailsa Chang about his book earlier today. CHANG: You say that intelligence in its best form is the objective truth, and that the goal of intelligence is to get inside the head of the president and of lawmakers when they're deciding policy. So what happens when policymakers don't believe in their intelligence apparatus? HAYDEN: Yeah, so they begin to make decisions based upon other inputs. Now, Ailsa, to be fair, it's rare that intelligence is the sole determinant of correct policy action. A lot of other legitimate things impact on a policymaker. HAYDEN: But I've always viewed the role of intelligence as creating the left and the right-hand boundaries of logical policy discussion. So if you're beyond one side, you're dividing by zero or something, and if you're beyond the other side, you're assuming water can be made to run uphill. In other words, you've gone in your policymaking to places where objective reality just won't allow it to succeed. And so if you deny intelligence its role, you deny yourself these boundaries. And that of course, I think, leads to some really serious situations. CHANG: But you don't only say that President Trump distrusts the intel community. You go a level deeper. You say that Trump actually lacks the ability to distinguish truth from non-truth. What basis do you have for saying that? HAYDEN: So let me begin with the distrust of the community, which is a national tragedy. We always have a challenge establishing a relationship with a new president. President Trump was always going to see the world quite differently than the way we did. But then the relationship building, that's stunted by the Russian interference. The first time we had to seriously talk with this president, we were trying to convince him of something that other Americans were using to discredit his legitimacy as president. So we began this in a ditch. Now, over to the way I think God made the president, Michael Gerson, President George W. Bush's best speechwriter, said that the president lives in the eternal now. And the purpose of intelligence is to provide, what's the history? What are the likely consequences? And so we have a president here who is spontaneous, has almost a preternatural confidence in his own instincts. And to be fair to the president, those were the instincts that got him elected when a lot of experts said that wouldn't happen. CHANG: But are you saying that President Trump doesn't believe the intelligence, or he just finds it irrelevant to final decision-making? HAYDEN: I think it's more the latter. Look; we have a lot of presidents who've argued about intelligence. And if that were the only case here, this would be just one other story. But here's a case of a president who's shown evidence that he bases his decisions not on objective reality. A classic - he claimed that Barack Obama wiretapped Trump Tower. John Dickerson of CBS was pursuing him on this question, saying, do you have evidence, Mr. President? What's the evidence? And the president's only response was, a lot of people were saying; a lot of people agree with me. All right? That is decision-making based upon something other than objective reality. CHANG: But when you say the White House is causing great harm to the public's trust in the intel community, is that where all the blame should lie? I mean, you observe in your book there have been a lot of leaks from the intelligence community during this administration, many probably from career professionals. Along with that, you and several of your former colleagues have become some of Trump's most outspoken critics now. Can you blame the public if trust in the intel community is eroding when that community looks angry and fractured and willing to undermine this particular White House? HAYDEN: I get that we occasionally look angry, although I try to stay with the fact-based case. But I don't think we look fractured. I think we all share a very broad concern with what it is that the president is doing. CHANG: Fractured with the White House. CHANG: And willing to undermine the White House publicly. HAYDEN: That's different. I don't know that. Now, I do freely admit in the book that this creates a great challenge for us because what we have here is a president who does not seem to be controlled by the traditional norms of the office. We have never seen a president speak like this, act like this, disparage people like this. And of course that generates a response from people who have been career professionals because we think what the president's doing is very harmful. The challenge we have is, how do we push back against that without breaking our own norms? And so for intelligence, it might be leaking. And so I have to be careful, people like me have to be careful when we are pushing back - which we think is quite legitimate - we don't make the problem worse by undercutting our own legitimacy. CHANG: You talk about Trump's disparaging style. You have criticized him and his use of Twitter. He's gone really hard on Twitter after Kim Jong Un, the North Korean leader, calling him names like Little Rocket Man. But here we are. Kim Jong Un and President Trump are trying to figure out a date and place to meet face to face for the first time. What do you think now? Is Trump's Twitter diplomacy, his belligerent style actually working here? HAYDEN: So a couple of thoughts. Number one, word is we are - now is the fourth time we've been here. This has happened with three other administrations broadly pretty much with the same promise and the same difficulties going forward. I want this to work. Full credit to President Trump and his team for amping up the pressure on the North Koreans - diplomatic isolation, military demonstrations, economic sanctions. That is great. But I don't know that even now - I'm looking back on that Twitter feud. I actually think that reduced the margin for error with regard to a very young and inexperienced North Korean leader during a very difficult time. So credit for getting us where we are, but I don't know that the Twitter use was what did it. CHANG: You lay a lot of blame with President Trump when it comes to dismissing truth, normalizing lying, propelling us into a so-called post-truth world, as you name it. How much is Trump singularly to blame for all of that? HAYDEN: Well, we have. And this is the core issue. We plural, the big we, are in a post-truth world, a world in which decisions are far more based upon emotion and preference than they are on objective reality, data and details. And that's an overturning of the Western way of thought since the Enlightenment. President Trump identified it. President Trump exploited it. And I think President Trump worsens it by some of the things he does in office. But the trend is well beyond him and well beyond America. CHANG: Michael Hayden is the former director of the CIA and of the National Security Agency. His new book is called "The Assault On Intelligence: American National Security In An Age Of Lies." Thank you very much for joining us. HAYDEN: Thank you. Transcript provided by NPR, Copyright NPR.